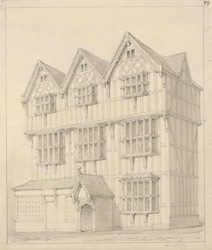 Drawing of a timber framed building called the Old House which lies in the historic High Town part of Hereford. This is one of the only remaining ornate black and white buildings in Hereford, after its memorable Jacobean town hall was pulled down in 1862. The Old House built in 1621, and although today it stands detached, originally it was part of a terrace called Butcher Row. A variety of businesses would have worked here over the centuries - butchers, ironmongers and bankers. It is now a museum.